Rightware attended TU-Automotive Detroit 2017 from June 7-8. This event brought together an impressive conference headlined by industry heavyweights and 150 exhibitors under one roof for several days of pure automotive biz and tech talk. Our theme was the Connected User Experience, and we showcased many Kanzi Connect demonstrations at our booth. Kanzi Connect is our latest product, enabling seamless integration of multiple displays in the car, consumer devices brought into the car, and online services, all while allowing the automaker to maintain brand identity across the experience. At its core, Kanzi Connect enables any data and any services on any display. Visitors to the booth experienced live demonstrations of key use cases: extending IVI functionality by integrating smartphone-based voice control; swiping objects from one screen to another, turning three separate devices into one extended user interface; and personalizing user profiles across all displays via a standard web browser. 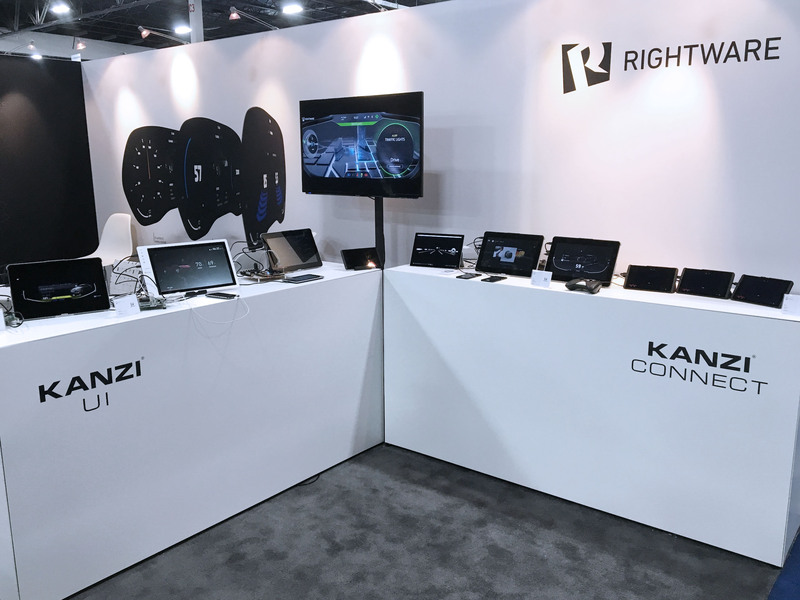 They also saw our original Kanzi Connect demonstrator, which integrates a digital instrument cluster, IVI, HUD, smartphones, tablets, and even an RFID reader for user identification, into one seamless user experience. Several members of the Kanzi Partner Program also showed Kanzi-based solutions at their booths. MapBox, the newest KPP member, showed integration of MapBox APIs into Kanzi Studio. OpenSynergy demonstrated their new Safe Instrument Cluster on Linux, running a UI developed by Rightware. And Green Hills Software demonstrated Safe ECU Consolidation, with a Kanzi-powered cluster. Finally, we took advantage of the Innovation Stage to give a 5-minute presentation highlighting our recent news from Google I/O related to the Audi Q8 sport concept car. As a Kanzi Connect tech preview licensee, Audi integrated Google Maps data from the Android Embedded IVI unit with online map data from the HERE Open Location Platform and rendered the resulting navigation in beautiful 3D on the safety-critical, Kanzi-powered cluster. Click below to watch this brief presentation. It wasn’t all work, though! We ran a raffle at our booth, giving away radio-controlled AWD monster trucks to two lucky winners. 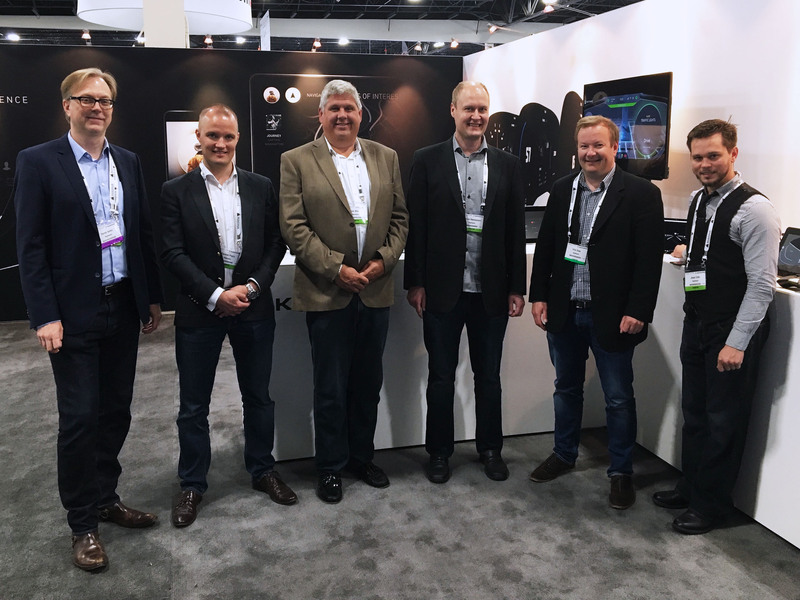 And we again participated in the Blackberry QNX Telematics & Tonics social event, which brought together over 400 industry participants. 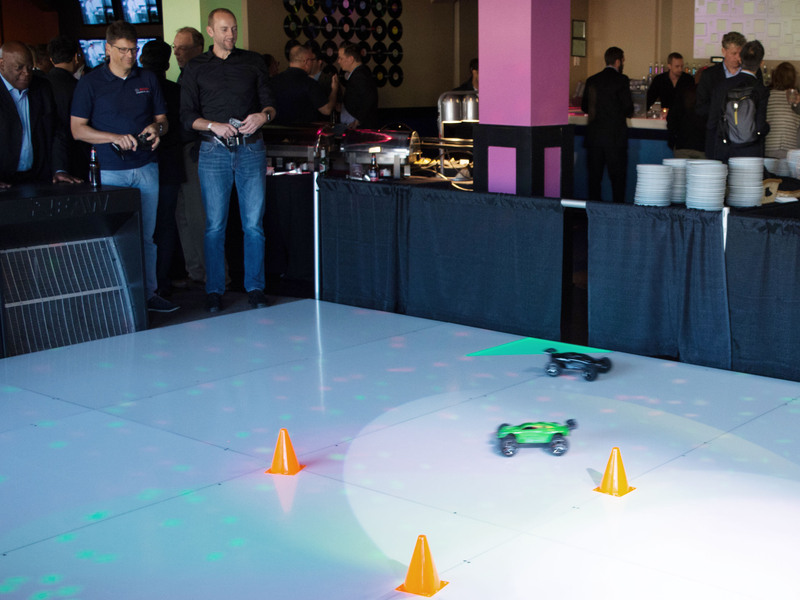 Rightware took over the dance floor to let guests (try to) race two of the RC cars. Thanks to Blackberry for arranging a pleasant evening of fun, food, and drinks, and an opportunity to make new connections. We had a great time at the event, and enjoyed meeting up with colleagues, customers, and partners. Thanks from the Rightware team to all who visited our booth or the party. We hope to see you next year at TU-Automotive Detroit 2018! The Kanzi Connect SDK is available under a technology preview program to customers seeking early access and an opportunity to provide input into the direction of its development. To find out more, or to request access to the program, please visit www.rightware.com/kanzi-connect/ and fill out the request form.